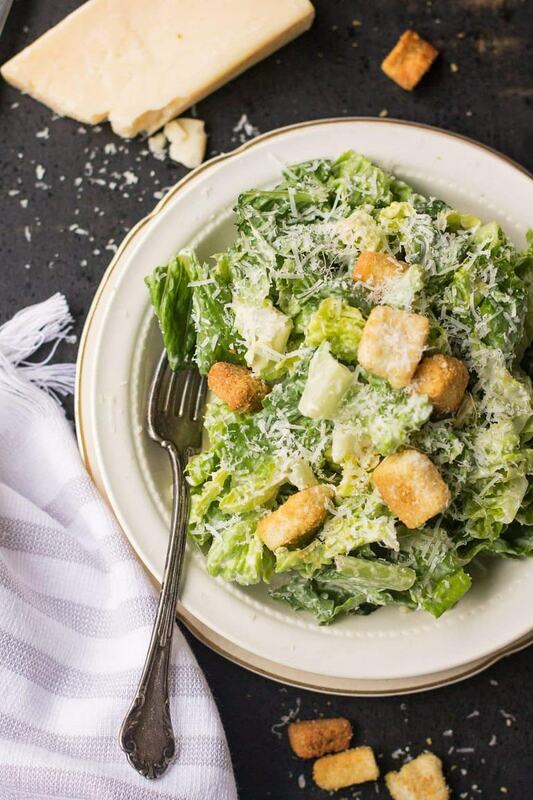 If making homemade caesar salad has always scared you (no thanks to the raw egg yolks that are usually involved) I’ve got a fantastic, family favorite solution that takes away all of the fear and delivers a big time, restaurant quality final result. All you need is a whisk and a bowl for success. This recipe is not traditional, that’s true. But I’d argue that it really is the single best homemade caesar salad I’ve ever had. And I’ve had a lot. Salty, bursting with garlic, and lemon and–oh yes–no raw egg yolks. If you didn’t already know it, most caesar salads are made with raw egg yolks that you whisk with just a few other basic ingredients. And no, raw egg yolks aren’t toxic–people eat them all the time and it’s totally FINE. It’s just that some people hear that and immediately run screaming in the other direction. Raw eggs are considered safe to eat if they’ve been pasteurized, but out here on the farm things like that just don’t happen. And I’ve always been a little worried serving them to my kids. Never mind how much sushi my 8 year old eats. I just try to stay in denial about that. Not to mention if you use raw eggs the dressing needs to be eaten post-haste. Like now. No hanging around. My recipe is made with mayonnaise so it’s more stable and will last well covered in your fridge for about 5 days and you can gobble it up on a whim. We have a lot of those whims around here. Homemade caesar salad just isn’t safe in this house. Then we should probably talk about the other thing people hate that they really shouldn’t. Anchovies. Those little fish. Even though I probably wouldn’t opt to cover my pizza in them, they are the BEST in this recipe. You need them. If you’re freaked out by the jar of anchovy fillets, get a tube of anchovy paste. It’s cheap (mine was $1.48 at the store today) and will last a good long time in your fridge. You’ll never know they’re in your dressing either. They just add a meatiness and a salty background. You can find them in the section of your grocery store where the canned tuna is. Don’t be scared. Just give it a try. Beyond that, the rest of the ingredients are smooth sailing. You should have most of them in your pantry already–if you don’t, getting them just means you’ll have everything you need for plenty of batches in the future. Add some chicken or roasted salmon for a one-stop meal, and feel free to whip this up with just a bowl and a whisk if you don’t have a food processor, but I will say that a little powerhouse like this is the only way to go. 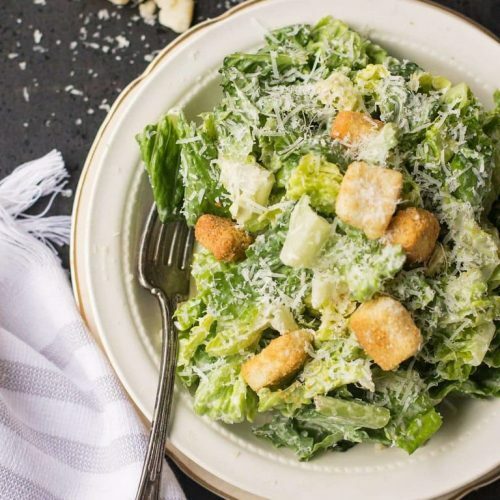 Homemade caesar salad only needs a whisk and a few simple ingredients plus this recipe has no raw egg yolks in it so you can feel confident serving it to anyone. If using a bowl and whisk to blend your dressing, make sure to finely chop or mash your garlic and anchovy fillets so they will blend in smoothly. If you are using a food processor, you won't need to chop them first. In a food processor, add all the ingredients except the olive oil. Process until very smooth--about 45 seconds or so. Scrape down the sides and bottom of the processor if needed. With the food processor running, slowly add the olive oil until it's all incorporated. If using a bowl, whisk the dressing constantly and quickly while adding the olive oil. Taste to adjust seasoning if needed. 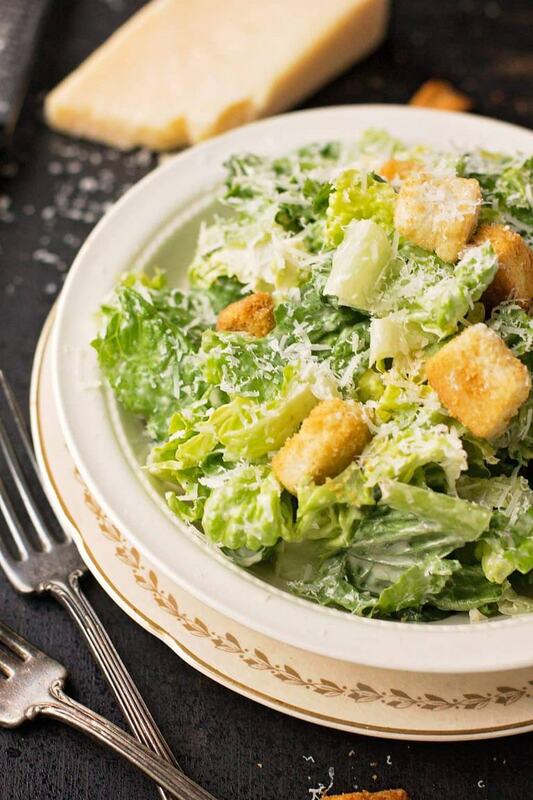 Transfer to an air-tight container or toss with chopped romaine lettuce, croutons and parmesan cheese. If storing, your dressing will last about 5 days. Discard any leftovers after that time. This dressing is awesome. Please try it, you won’t regret it. That’s what I say too Helen! Hahaha!!! Love that it has no eggs!